We returned from a wonderful trip to Puerto Rico this week, it was truly a great Island to visit posts to follow, feel free to see facebook page for photos. Unfortunately our wee guy got sick the last day so we visited the local ER flew back and saw a dr here, he has an ear infection and hand, foot and mouth and is slowly recovering. Good lesson is to always choose destinations with hospitals close by with little ones. 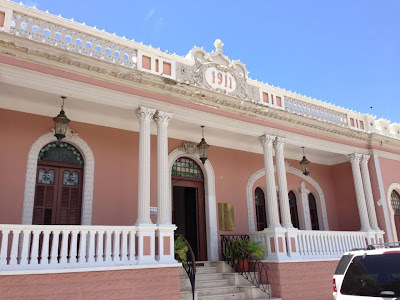 One of the towns we visited in Puerto Rico was Ponce in the South I was really taken with the old Spanish buildings there, this one is the historical museum. Stay tuned for a photographic blog post of this charming town.